EA’s E3 2017 keynote showcased games that were revealed earlier this year with two minor exceptions, and the one you should pay attention to is an indie game called A Way Out. A Way Out may not have been as hyped as the 52-second trailer of Anthem, the new game from BioWare, but it just may be the most exciting game at this year’s E3 – and I say that after going hands on with Need for Speed Payback, Madden 18, FIFA 18, Star Wars Battlefront II and most of the other upcoming titles coming from the EA. What sets A Way Out apart from those other big budget franchises is that it’s, well, not a big franchise. 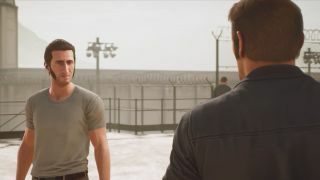 A Way Out is made by the small independent team and the lead designer, Josef Fares, that created Brothers: A Tale of Two Sons back in 2013. It’s part of EA Originals, a program that supports indie developers like Fares’ Hazelight studio. “I’m making the game I want to make,” Fares told me. “It’s a game that comes straight from the heart. You’re going to frickin’ love it.” Well, OK, he didn’t use the word frickin’. It has the credentials to reach that same level as Brothers but, instead of a tale of two wayward siblings, you’ll play one of two convicts, Vincent and Leo, working together to escape. It’s grittier than Brothers, but that bite is just one of the many reasons I think it’s one of the best games from EA this year. That’s right. There’s no such thing as single-player here. It’s you and a friend (or stranger if you’re playing through it online) or no one. The best comparison for A Way Out, strangely, is to the co-op puzzles from Portal 2. These required communication, strategizing and impromptu inventiveness. You’re working with someone ... for better and for worse. Your decisions impact them, and theirs affect you. For example, in the level I played with Fares at my side, we were tasked with robbing a gas station. The first decision came immediately: who gets the gun? The decision, seemingly minor, shapes the mission as the person with the gun is the one who actually initiates the robbery. Give it to someone who’s trigger-happy and police will arrive faster than you can complete the mission. Decisions, as I mentioned, need to be made together lest you both fail. We proceeded to clear out the area of civilians first, and cut phone lines so police couldn’t be called before we stole the cash from the safe. Surprises popped up along the way – it’s no easy business being a criminal – but we eventually escaped with our hard-earned cash. This section I played with Fares, I should point out, was all done in third-person and it played like an action game. It was only a few minutes long (only five to 10 depending on how fast you cleared out the civilians) and yet it took Fares and his team five months to build it. But third-person action sequences like these will only be one part of the overall game. There will be stealth levels ... and driving levels ... and 2D platforming sequences … the list goes on. This is very much like Fares. He’s a passionate man. He does more or less what he wants. He repeated over and over how this is his vision, his passion. He’s making it and he doesn’t want to be told when to do it or how to do it. It’s this pursuit of doing exactly what he wants that made his first break-out game, Brothers: A Tale of Two Sons, such an innovative game in a swath of similar-looking games. It’ll be hard to live up to that level this time around – and a challenge considering just how many types of gameplay styles Fares has planned. But, if you ask me, I’d take a game like Brothers: A Tale of Two Sons or A Way Out over the next Need For Speed any day. E3 is the world's largest exhibition for the games industry, stuffed full of the latest and greatest games, consoles, and gaming hardware. TechRadar is reporting live from Los Angeles all week to bring you the very latest from the show floor. Head to our dedicated E3 2017 hub to see all the new releases, along with TechRadar's world-class analysis and buying advice about the next year in gaming.